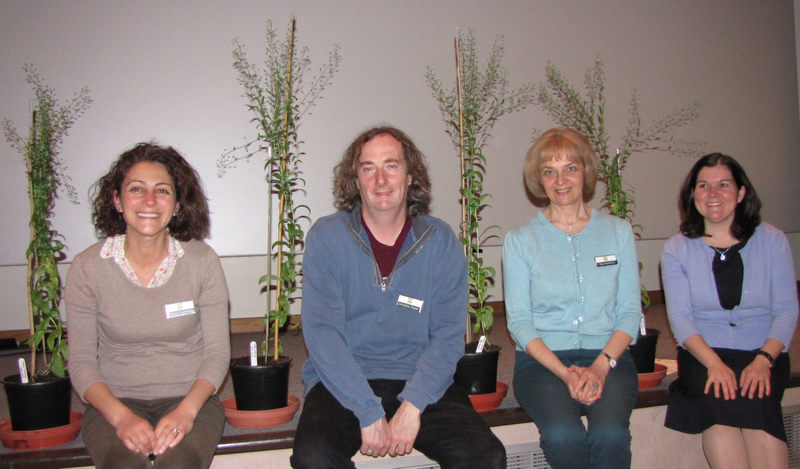 Left to Right Dr. MatinaTsalavouta (Communications Officer, Rothamsted Research) Professor Johnathan Napier, Dr. Olga Sayanova and Dr. Adelia de Paula, Science Communicator Rothamsted Research. 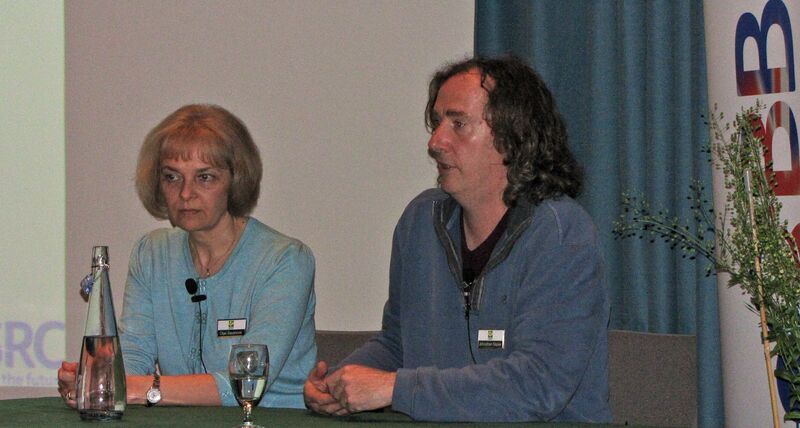 A packed conference centre at Rothamsted Research on Thursday April 24 listened intently to Professor Johnathan Napier and Dr Olga Sayanova as they confirmed details of the strictly controlled field trials taking place this Summer. Permission having been granted by Defra on 14 April 2014. A fairly small area (~12m X 10m metres) has been allocated for two blocks of GM Camelina with one block of non GM Camelina as a control. The whole area will be protected from insects with netting during flowering to ensure no cross pollination can take place. (Camelina plants are normally self-pollinating so this is just an additional precaution). The trial will run for four spring/summer seasons 2014 -1017. The results will be analysed and published after peer review in the appropriate Open access scientific journals. The objective of the trial is to test whether GM Camelina sativa plants are able to make significant quantities of the omega-3 long chain polyunsaturated fatty acids (EPA and DHA, which are typically found in oily fish) in the seeds of the plant when grown under field conditions. No conventional plant sources of these fatty acids currently exist. It is well known that eating regular portions of oily fish like salmon and mackerel or taking supplements like cod liver oil capsules can provide significant health benefits, such as helping to provide protection against cardio vascular disease and type 2 diabetes. What is not so well known is that fish do not make the omega-3 oil themselves, in the wild they acquire it from algae and in fish farms its included in the fish feed. The oil is absorbed into our own bodies when we eat the fish. 50% of the worlds’ fish now comes from fish farms so the demand for oil to include in fish feed is growing fast. As a result of the ever-growing world population the upcoming challenge is to meet the increasing demand for omega-3 fish oils from fish farms and the human consumption of fish oil supplements. The rationale for the experiment is, therefore, to find a sustainable agricultural way of producing these omega-3 long chain fatty acids. 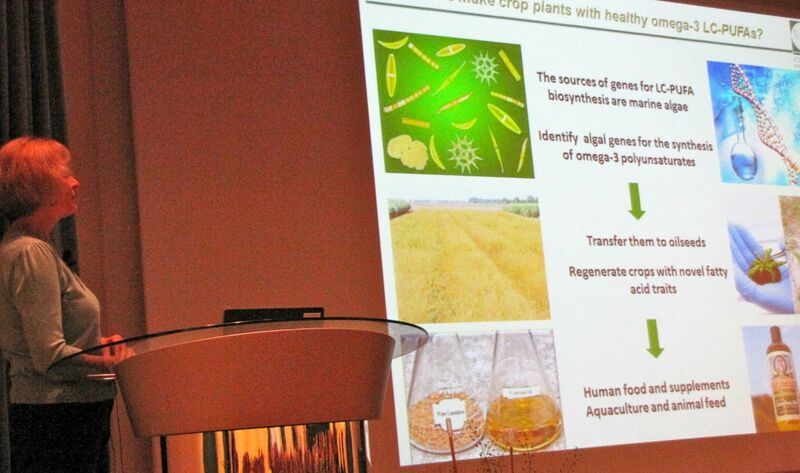 The complicated process which the scientists have been working on for ten years to create GM Camelina was described by Dr. Olga Sayanova. Details about this can be found on the Rothamsted Research web site. The event (run in conjunction with The Harpenden Society) was hosted by Dr Adelia de Paula and concluded with a lengthy Q&A session with questions from the audience, which included over 50 members of The Harpenden Society. NB. There are no fish feeding experiments planned as part of this field trial. However there are other experiments using plants grown under Rothamsted greenhouses where they use the oil from seeds for fish feeding experiments.